It's been a while since I wrote anything about the daily auroras we get down here, and the photos are starting to pile up, so here's a photo-heavy post to catch up a bit. They really are a significant part of my days, and sharing pictures is starting to seem like one of the best ways to give people an idea of what my life is like. Saying that we have auroral storms every day may sound like an exaggeration, but to a very good approximation, we do. 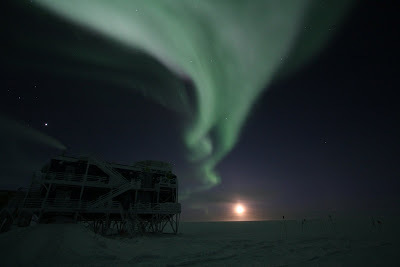 We may get one day every week or two where the auroras are only a faint green glow, but most days we will have at least a couple of bright bands or curtains hanging overhead. Auroras seem to come in two general forms, the static band or ribbon, which hangs overhead moving very slowly or not at all, and the much more active dancing variety. They usually form fairly contiguous bands, stretching nearly from one horizon to the other. 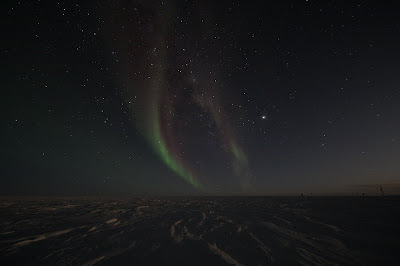 Auroras form primarily along the "auroral oval" which encircles the magnetic South Pole, and passes directly over the geographic South Pole (where I live). 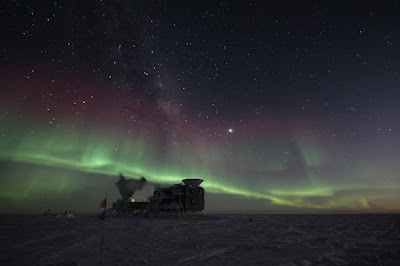 Because of this, they tend to orient themselves in a particular way, perpendicular to the path between the station and dark sector, and all of the active ones tend to happen over the ICL (Ice Cube Lab - where the Ice Cube neutrino detector houses its electronics). These photos are all long exposures - at least 15 seconds, and usually 30. 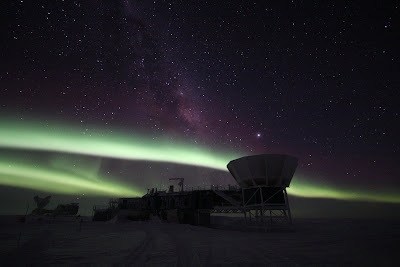 The SPT (where I work) is among the most photogenic bits of life down here, but unfortunately, it's usually in motion and blurred in any aurora photos. Instead, I tend to use MAPO (the nearest building to SPT, and wonderfully stationary) as a foreground. These photos include what is probably my best shot of the season, which has been widely borrowed, particularly for the Midwinter's Greeting card. 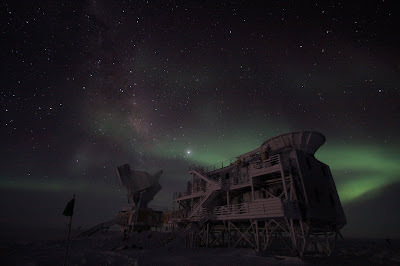 Far from being six months of frozen darkness stranded on a barren icescape, life here really is beautiful. oh my god. i actually dropped my jaw when I saw these. That third one looks like a swan!